1Department of Biology, Laboratory of Biochemistry and Molecular Genetics, Faculty of Science and Technology, University Abdelmalek Essaadi, BP 416, Tangier 90000, MOROCCO. 2Higher Institute of Nursing Professions and Health Techniques of Tetouan, Annex- Tangier, Marchan 90000 Tangier, MOROCCO. Context: Several aromatic and medicinal Morrocan plants have been used traditionally in pharmaceutical products and traditional medicine for the treatment of several pathologies. Objective: Evaluation of the protective power of nine Moroccan plants ethanol extracts against some strains of bacteria. 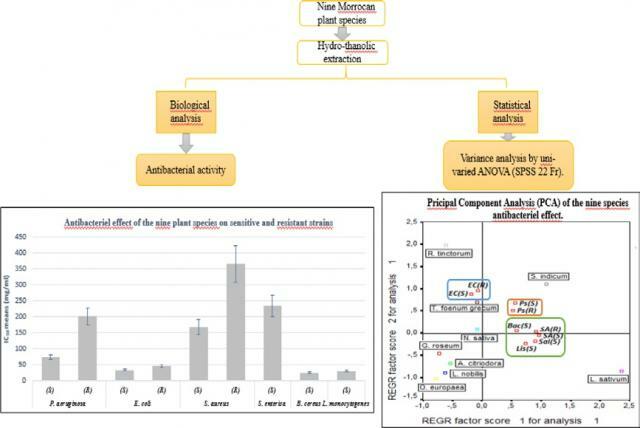 Method: The antibacterial activities of ethanolic extracts (EE) were evaluated using agar-well diffusion method, minimum inhibitory concentration (MIC), minimum bactericidal concentration (MBC) and IC50 against nine foodborne bacteria [Bacillus cereus, Listeria monocytogenes, Staphylococcus aureus (PN15 and 25923), Escherichia coli (TF2 and ATCC 25929), Pseudomonas aeruginosa (P116 and 195) and Salmonella enterica]. Screening of chemical constituents was carried out as well. Results: We noted the presence of leuco-anthocyanins, anthocyanins, essential oils, alkaloids, and aldehydes in the extracts. The strains of S. enterica followed by S. aureus and P. aeruginosa were the most resistants to the extracts effect. The principal component analysis (APC) demonstrated that the highest antibacterial activity was that of L. nobilis and O. europaea ethanol extract (EE), which was directly bactericidal on all the strains tested with the exception of P. aeruginosa. While, R. tinctorum, S. indicum and L. sativum were characterized by the lowest activity. Statistical analysis: Analysis of variance was performed by uni-varied ANOVA in the software SPSS 22 Fr. Conclusion: The active compounds were soluble in ethanol. The antimicrobial activities of L. nobilis and O. europaea may contribute to understand their involvement in pharmaceutical products and traditional medicine against many microbial infections. Btissam R, Fatima EI, Mohamed NH. In vitro Study of Antibacterial Activity of Hydro-Alcohol Morrocan Plants Extracts. Pharmacognosy Journal. 2018;10(3):519-526.